-To complete the FOIL Form you MUST PRINT IT OUT, SIGN IT, and submit it to the Waterloo Police Department. -Copies of police reports are generally available 5 days after the FOIL request is made at the police department. 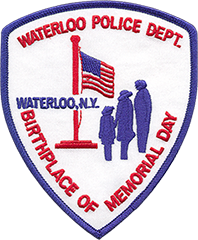 A member of the Waterloo Police Department will contact you when the copy of the report is ready to pick up. This form requests that the WPD Road Patrol check your property while you are out of town. Yes, it has an alarm. No, there is no alarm. IT IS VERY IMPORTANT THAT YOU GIVE US A METHOD FOR CONTACTING YOU. PLEASE PROVIDE AN ACCURATE AND COMPLETE ADDRESS AND PHONE NUMBER.